U.S. Customs and Border Protection is facing an “unprecedented humanitarian and border security crisis,” according to officials. Last week, the agency reported having more than 12,000 immigrants in custody. Border Patrol was on pace to apprehend more than 100,000 immigrants in March, the highest number in more than a decade, he said. Yet unlike 10 years ago, a large percentage of recent immigrants are families with children, which Mr. McAleenan said creates an enforcement challenge. Tens of thousands are claiming asylum. President Trump has again threatened to shut down the U.S.-Mexico border. Humanitarians working there, however, see the crisis differently. Border Patrol was on pace to apprehend more than 100,000 immigrants in March, the highest number in more than a decade. According to Syracuse University, immigration judges decided 42,224 asylum cases in 2018, a record number. In those decisions, 65 percent of individuals were denied asylum, the sixth year in a row that the rejection rate l has increased. In El Paso, a network of 18 shelters receives the asylum-seeking families from Immigrations and Customs Enforcement. Annunciation House, an organization that has served vulnerable people in the El Paso-Juárez border community for more than 40 years, coordinates with the various shelters to find space for the released asylees. They are always looking for more space. “We are responding in our own ways to the influx,” said Marisa Limón of the Hope Border Institute in El Paso, noting that the Diocese of El Paso oversees two shelters itself. She described a vast network of volunteers from different faith and humanistic backgrounds coming together to gather clothes and food and providing for other needs of the asylum seekers. Images of huddled families detained under an El Paso bridge circulated last week. Ms. Limón said that there was no reason for the immigrants, many of whom were likely asylum seekers, to be there. Those immigrants were moved over the weekend. The real crisis is not about security but about morality, Ms. Limón said. “After the media leaves, after this is no longer a topic on social media, those are still people under that bridge,” she said. The news of the surge in immigrants comes as the Trump administration has begun implementing its “Remain in Mexico” policy at the El Paso-Juárez border. Under this policy, immigration officials return a number of asylum seekers to Mexico while their cases are decided by the U.S. immigration court system. It was first implemented at the San Ysidro port of entry at the San Diego-Tijuana border. The news of the surge in immigrants comes as the Trump administration has begun implementing its “Remain in Mexico” policy at the El Paso-Juárez border. Some immigrants in Tijuana attend workshops hosted by Al Otro Lado, a binational group that serves immigrants and deportees. Paola Marquez of the Catholic Legal Immigration Network said their center in Tijuana “was not built to handle so many people.” It has gotten busier since the “Remain in Mexico” policy was implemented. According to Tania Guerrero, an attorney with Clinic, the “Remain in Mexico” policy’s trial run in Tijuana “did not go well.” She knows of at least one immigrant who was asked to wait in Mexico but was not let back into the United States for his assigned hearing. “C.B.P. calls them ‘glitches,’” she said of such errors. The Diocese of Juárez is setting up a commission to address the growing number of immigrants in the city, Father Mosher said. The migrant shelter there is already full. “We think [the ‘Remain in Mexico’ policy] is a really bad policy on our government’s part,” Father Mosher said. “I don’t understand why Mexico agreed to it.” He noted the seemingly “180-degree reversal” in U.S. policy from the 1960s when the government condemned the Berlin Wall. Thanks! IMHO all Catholics should be up in arms about the way immigrants and refugees are being treated. Child concentration camps, forcing asylum seekers back to Mexico, breaking up families in this country and separating parents from their children is such a basic denial of life and human values. I can't understand how this is not generating huge Catholic marches and churches offering sanctuary. Totally agree, Robin! I don’t understand it either. And I don’t understand how Catholics can support these policies. Pope Francis is with us: he said he could not imagine the cruelty of efforts to repel fellow human beings. I can’t go to the border myself, but I am going to send $$$ to Annunciation House in El Paso. Go to www.annunciationhouse.org to see how they have been serving “the migrant, homeless, and economically vulnerable peoples of the border since 1978” and to make a donation. Before the caravans crossed into Mexico, President Trump said not to come because they would not be allowed into the US. After they crossed, the President said go back because we will not let you cross the boarder. "Good hearted" liberals said they are refugees, they should come. Catholic Bishops said it is unhumanitarian, let them come. California cities said they would give them asylum and not cooperate with CBP, come on in. Now there is a boarder crisis and these same people are saying it's Trump's fault. I suggest they get the log out of their eyes before blaming the President. No one is stopping all of these "good hearted" people from sending goods and money, and going themselves to help. Getting angry and shouting, tweeting, texting, emailing and posting helps no one except maybe the venter. You have ignored an important issue. 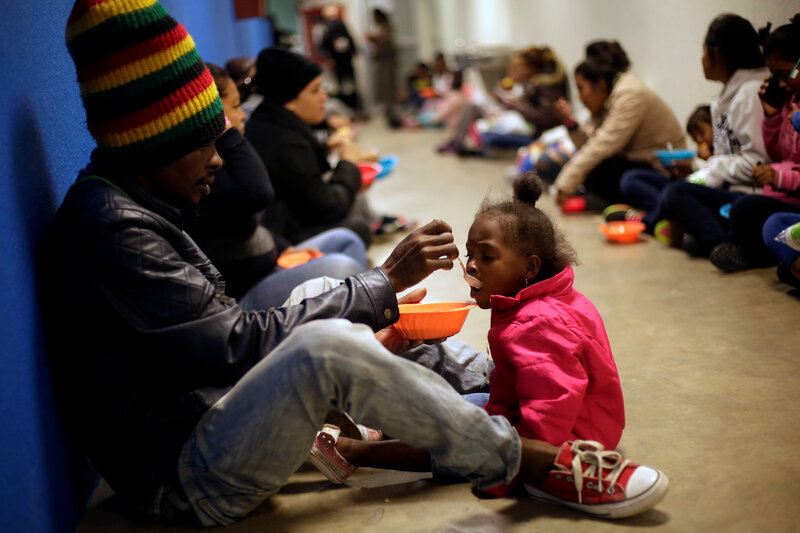 The U. S. recognizes the right of asylum as specified by federal law and international law. Refugees may come into the country to apply for asylum, which may or may not be given to them after their applications are reviewed. Trump is ignoring the law by stopping these people from entering the U. S. to apply for asylum, thus creating chaos, people living in deplorable situations, and worse, separating children from their families. I can’t believe the inhumanity with which the children are treated. God must be outraged. If Trump does not want the refugees to come into the country and apply for asylum, then fine, but he should work to change the law, not break it. He also needs to withdraw the U. S. from all the international agreements we have with other countries in which we all agreed to do that. Currently, Trump is breaking the law. We are a country that lives under the rule of law…not under the rule of Trump. When President Obama was in office, migration was at its lowest in 50 years. Trump entered office with his inflammatory and threatening statements and has caused a crisis on our border. Trump could have ordered more judges to the border to process the refugees in an orderly fashion. Instead he has practically emptied out the top personnel of Homeland Security leaving us even more vulnerable. Please point out to me what liberals encouraged the refugees to come here. Liberals complained about the refugees’ treatment, and rightfully so, but I don’t recall them encouraging anyone to leave their homelands and come here. I wait for your response. Below is a link to Trump's written order on the deportation of undocumented residents. It is annotated by an immigration law expert, David A. Martin, the Warner-Booker professor of law emeritus at the University of Virginia. You can see the many problems created.